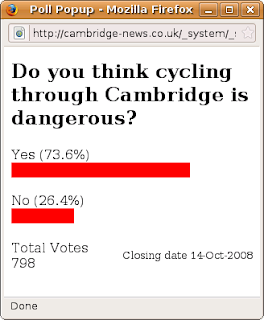 "This city has the highest rate of cycling in the English-speaking world." I see from Wikipedia that Cambridge's population is 108,000. In Ontario that barely qualifies as a city. There are Toronto neighbourhoods with larger populations that have higher rates of bicycle use. I well remember the bog-awful situation with roadworks in the UK, here in Germany it's a lot better, and there is at least an understanding that bikes need decent bike lanes even when there are. Usually we're catered for. Well of course cyclist are (..) treated friendly by motorists in the Netherlands. When us cyclists got hassled too much, we'd go travelling by car as well and the traffic jam would totally out of control. Not only do roadworks here in the UK ignore the needs of cyclists, but the outcome is often a re-designed road layout that includes features that, while solving a problem for motorists, creates one for cyclists. For instance, a junction where two lanes diverge, gets an 'island' added, and pedestrian traffic lights. It means cyclists have to get in lane much earlier, at a point when traffic tends to flow faster. Many have taken to using the pedestrian crossing, and the pavement.